A reported 10,000 people attended a demonstration Sunday afternoon 10 August outside the Sensus public swimming pool at Medborgarplatsen, downtown Stockholm. 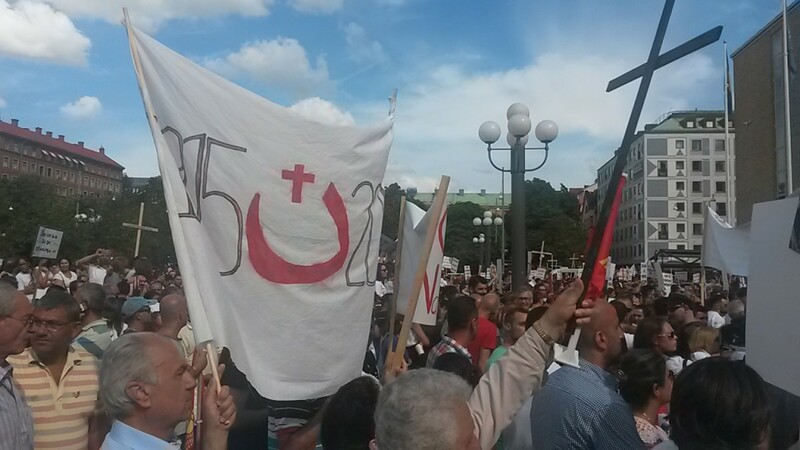 The protest, put together by various religious and secular organizations, aimed to unite Iraqi, Syrian, and Lebanese Christians in Stockholm to call on the government to intervene in the reported violence against Christians in Iraq. Political leaders from across the spectrum took to the podium to show solidarity with the plight of Christians and add their voices to the call on government to take action against the Islamic State (IS) in Iraq and Syria. Christian Democrat MP Robert Halef spoke first in Aramaic before switching to Swedish. Schlomo is peace in Aramaic, close to its Hebrew version shalom. “This is not a protest about property tax!” – fredrik malm. revs up the crowd. For context, he said that Sweden must give back to your homelands as you have given to Sweden. Christian religious leaders also attended and spoke at the rally, representing the Roman Catholic, Syrian Orthodox, and Antiochian Orthodox churches. Artists, singing in both Swedish and Arabic, provided time for reflection and prayer, away from the steady stream of political statements. Halfway through the protest, groups carrying the ethnic Syriac and Assyrian flags were seen waving them despite calls by organizers to take them down.